My mom used to make this amazing soup whenever it was super chilly outside or one of us wasn't feeling good. 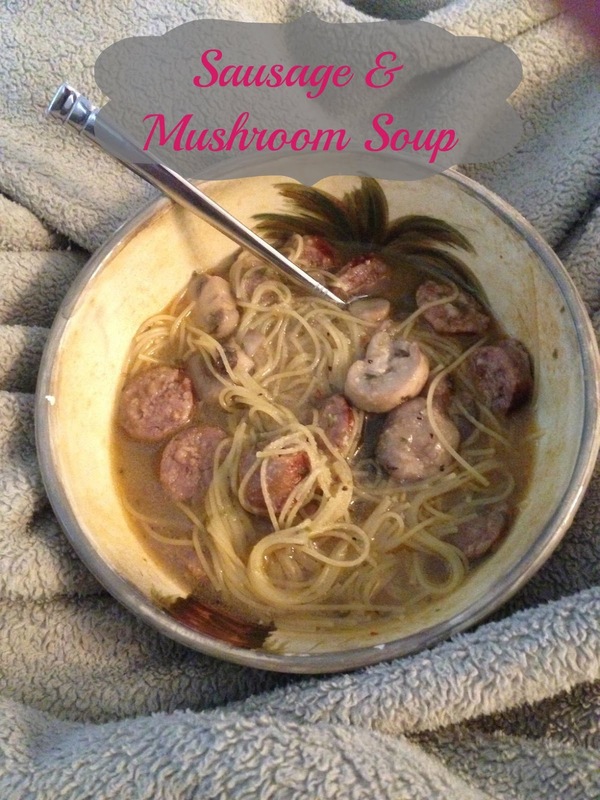 Bella woke up not feeling so hot yesterday so I thought it was a perfect time to whip up my Mom's Sausage & Mushroom soup! 1/8 teaspoon fresh ground black pepper Directions: In a large pot, heat 1 tablespoon of the oil over moderate heat. Add the sausages and cook, turning occasionally, until browned and cooked through, about 10 minutes. Remove. When cool enough to handle, cut the sausages into 1/8-inch slices. Heat the remaining 1 tablespoon oil in the pot over moderately low heat. Add the onion and garlic and cook, stirring occasionally, until the onion is translucent, about 5 minutes. Add the mushrooms and cook until golden, 5 to 10 minutes. Add the broth, thyme, red-pepper flakes, 2 tablespoons of the parsley, and the salt to the pot. Bring to a boil. Reduce the heat and simmer, partially covered, for 15 minutes. Stir in the sausages and bring back to a boil. Add the pasta, reduce the heat, and simmer until just done, about 3 minutes. Stir in the remaining 2 tablespoons parsley and the black pepper. Printable Recipe It came out delicious & Bella actually loved the noodles & ate most of hers, which is amazing all by itself! Enjoy!